It’s… well. It’s one of the best tasting cakes I have ever had the privilege of making. But here is the thing… I am going to share TWO recipes for this cake. The reason being is that when I made it from scratch I used Rose’s Caramel Cake. I made it and loved it. Then I made it again and tried to tweak the recipe, but to no avail. Every change I made did not help, and more likely it took away from an already perfect recipe. This was especially true about the caramel icing. There was absolutely zero changes I could make to improve upon the texture, flavor and consistency of that sauce. It’s down right amazing. That is the from-scratch recipes if you are willing and able. And I do recommend it, that flavors are sensational! The recipe I am going to list below is the semi-homemade version, using a box mix, caramel sauce in the jar and Cool Whip®. 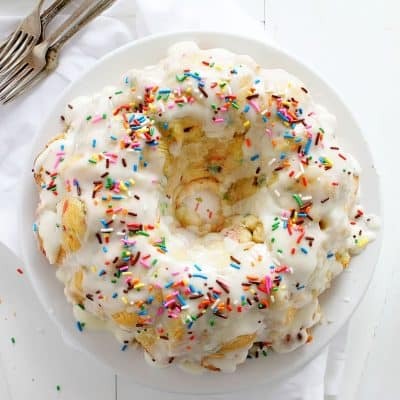 Just because I can’t post this beautiful and delicious cake in the completely from-scratch form doesn’t mean that I can’t provide some sort of recipe for you to use! 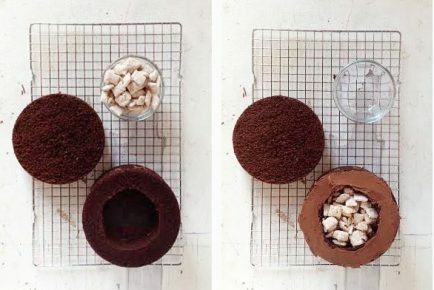 Make the cake in two square 9-inch cake pans. I prepared them by coating with Goop and then lined with parchment. 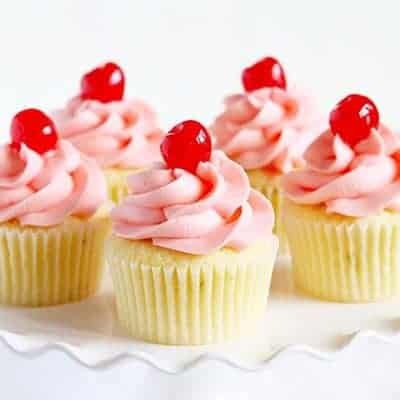 Allow cakes to cool to room temperature. 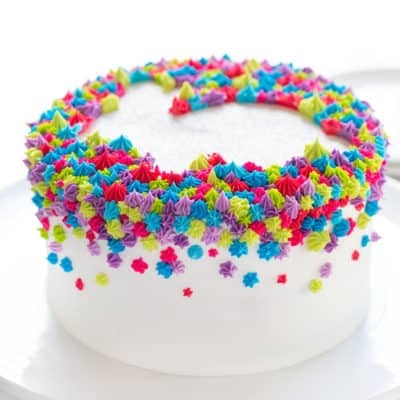 Level cakes to the same height. 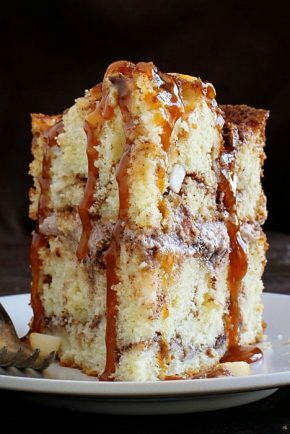 Place one square layer cake on cake stand and cover in approximately 1/2 cup of caramel sauce. You will want to sauce to be warm enough to move, but not runny. (The consistency can all be controlled through temperature at this point.) 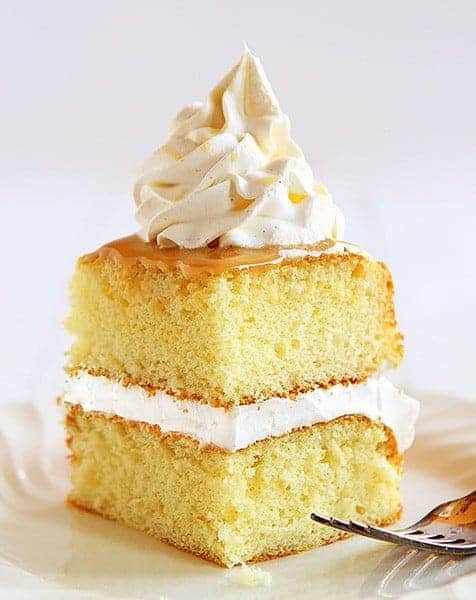 If your caramel sauce is too runny, allow it to cool more before finishing covering this layer of cake, we are trying to avoid a puddle of caramel around the base of the cake. After you have poured caramel on cake, chill it for about 15 minutes in fridge or 10 minutes in freezer. You want to ‘set’ the sauce as much as possible. 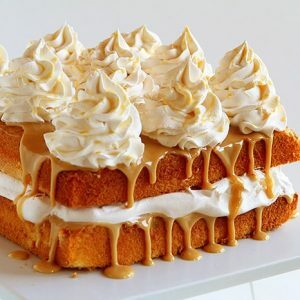 Once caramel sauce is covering cake and firm, you can prepare it for the next layer. Cut a straw into four equal sections and place in the four corners of the cake. This step isn’t pretty, but is essential for this cake. The whipped cream is not sturdy enough to hold the weight of the cake above. Add about 1 cup of whipped cream to the cake and smooth out. You will want to whipped cream to be no higher than the height of the straws. 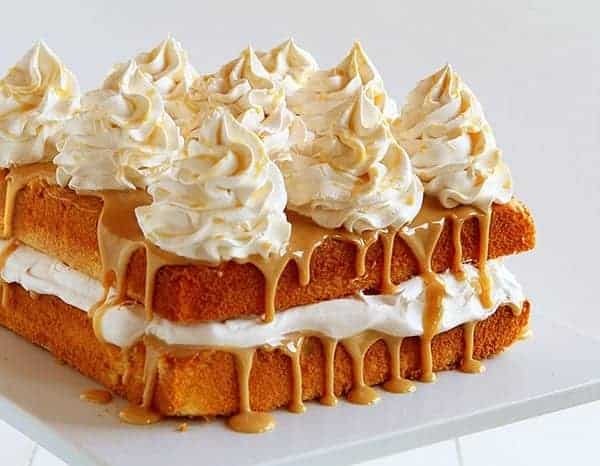 Place next layer of caramel cake on top of whipped cream layer and repeat the step of pouring the caramel icing over the cake. Use a bit less at first, as you do not want it to drip too much. Sprinkle with about 1/2 tsp of cinnamon (it’s a small amount, feel free to adjust to fit your tastes). Prepare yellow cakes according to the directions on the box in 9-inch square cake pans. Pour caramel sauce (about 16 ounces) into stand mixer. Add one cup of confectioners sugar and whip at medium speed until incorporated. 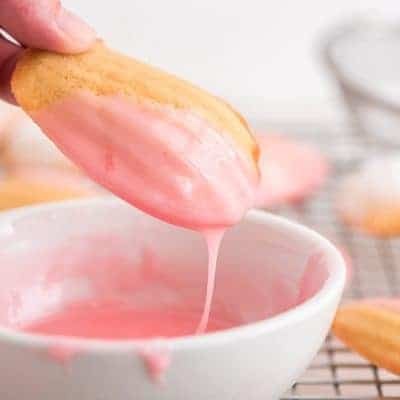 You may add more confectioners sugar if needed; you are looking for a fairly thick consistency, one that is not overly runny. 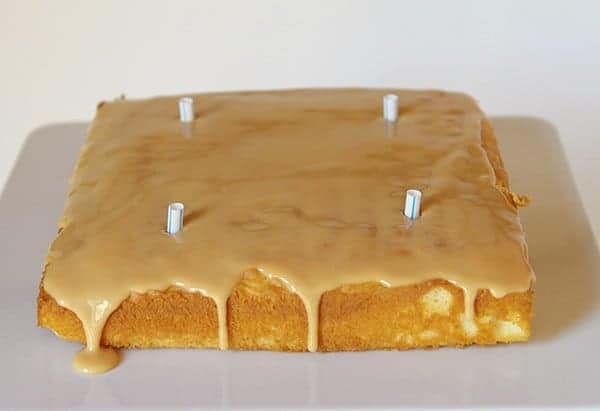 Place one layer of cake on cake stand and cover in about 1/2 cup of caramel frosting you just made. 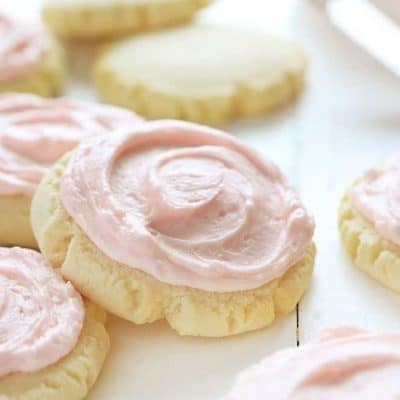 Open store bought whipped cream and add in 1 tsp. cinnamon and 1/2 tsp apple extract or up to 1 tablespoon of apple cider. Place about 1 cup whipped cream on cake and level. 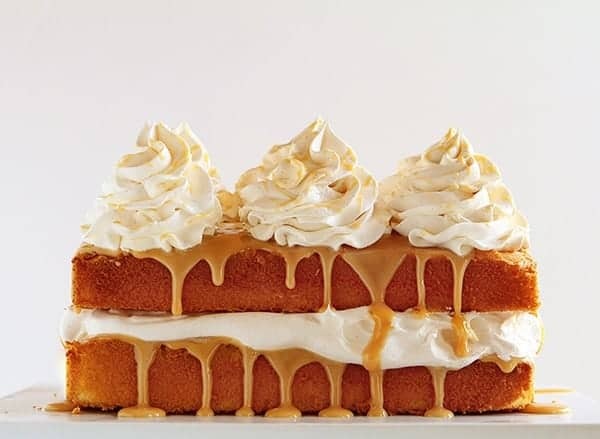 Repeat with next layer of cake and caramel, then pipe mounds of remaining whipped cream. 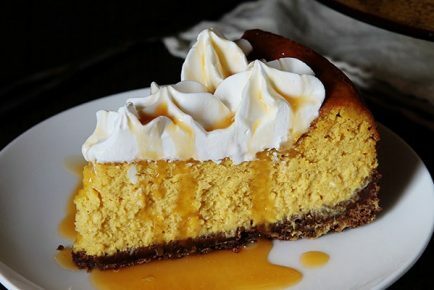 TIPS: You want to cakes to be as level as possible so nothing goes sliding off with that beautiful caramel. The caramel will become more runny the warmer it gets. 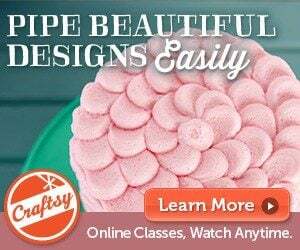 If you are able to give your cakes a slight concave in the center that would work as well. Want to know the BEST (easiest) ways to level a cake? My favorite method is a cake leveler, and I show that in detail here. Flatten the cake right out of the oven. Using a CLEAN dishcloth folded over, press down on a hot cake. Press into the dome only, making sure the dome is level with the edges of the cake. Be very careful with this method, as you want to do it when the cake is very hot. The caramel is the trickiest part. Once you are able to determine the best consistency to work with you will be set! I found that the best way to practice was to use cupcakes and my guinea pigs. (plus… yum! Will share that recipe soon!) 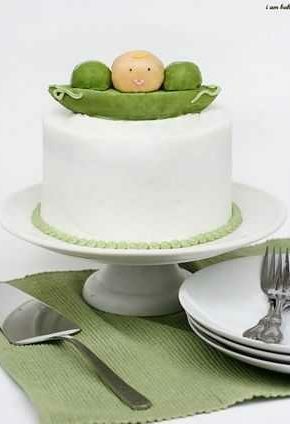 If you need this cake for a special event, be sure to practice first! 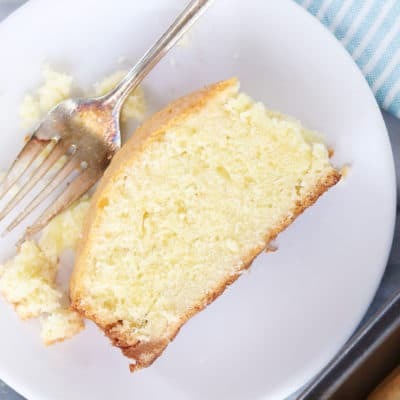 If you make the cake from scratch, you will have THREE layers of cake (lots of batter, never fill your pan more than 1/2 full). I don’t recommend making this cake into a three layer (stability is an issue), so freezing the extra layer is a great option. In the semi-homemade recipe I added powdered (confectioners) sugar to store bought caramel sauce. I KNOW! I know. This is nuts. But what I was going for in consistency. The sauce needs to be a little thicker so that it does not simply spill out over everything. You can skip adding the powdered sugar and just use much LESS caramel sauce so that spilling over is not an issue. Apple Extract is not easy to find, I had to order some. (Pure Apple Extract from OliveNation). You can substitute apple cider, but make sure that you start with teaspoons and taste test after each addition. Be careful to not add too much liquid to the store bought whipped cream as it could become too runny to pipe. This Caramel Apple Cake is WORTH the work! It’s amazing. Delicious! Those flavors are genius and wonderful and a must for fall and holiday gatherings. I styled this cake exactly like my Chocolate Pumpkin Cake and Red Velvet Peppermint Cake. It’s a show stopper for sure! 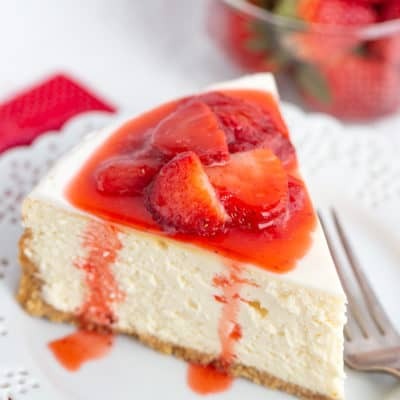 Whenever I think of cake perfection I think of you. This looks amazing and the flavours are just my absolute favourites! Pinned for a rainy day. Hi. I love your instructions for constructing the cake, but I do have one question. 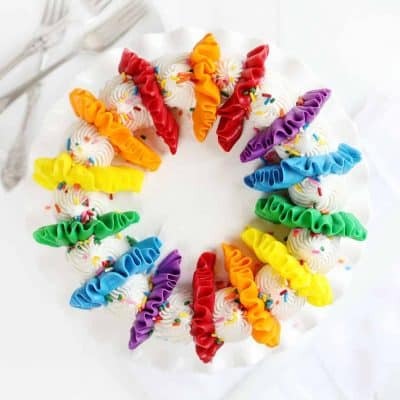 If you use straws, won’t the weight of the cake just cause the straws to push into the upper layer and squish out the whip cream? 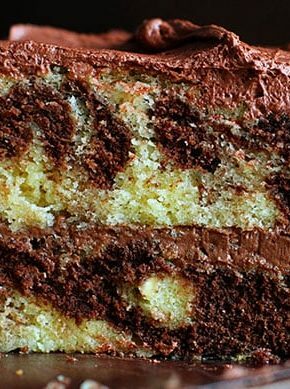 Especially if you are doing this for 3 layers like the mississippi mud cake? How do the 4 straws hold up an entire cake layer? thank you! 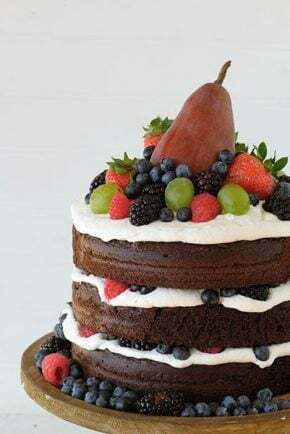 This Cake is looking soo beautiful, I will make it on this sunday at my brother’s birthday. I have understood this recipe. 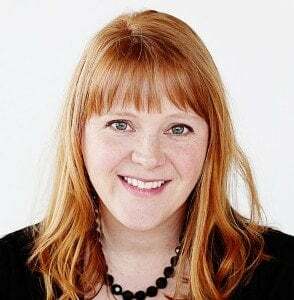 Nice article, It is too simple!!! !